Yesterday I shared which of the lampshades I bought for our top spare bedroom from Lush Designs, today I'm sharing more from their shop. And just look how much we had to choose from. Even in black and white you can tell the choice wasn't easy. Let alone when you add in the colour and which designs come in which colour. Thankfully though the people at Lush Designs know their stuff, they know what comes in what without looking it up and can guide you on actually making a decision. I guess they must be used to people unsure just which of their designs to choose! 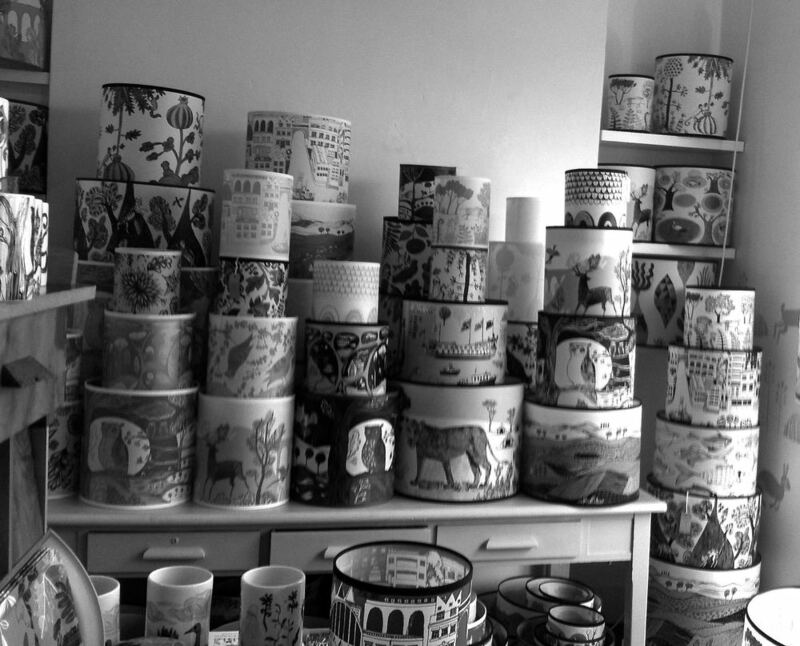 It's not just lampshades though, there's a whole range of tins, trays, mugs and much more than I could mention. Each has their unique feel to it. They even sell their materials, and I was very tempted by this remnant box left casually by the till. I resisted on this occasion but the danger is, now I know it's there! The other thing that I know I'll be back for at some point is these notebooks. Again my trouble will be choosing which one to go for. Maybe I'll just add one of these to my Christmas list and leave the decision to someone else! And you don't have to live close to Greenwich to be able to own any of these fab items as you can order online. I've not tried the online service - I don't need to as I just wander down from Blackheath but I can vouch for the items, they're fantastic. And as well as the lampshades I shared yesterday I also bought these fabulous oven gloves. They're replacing some with a hole in so while I should be using them, I haven't yet managed to bring myself to use them just yet. I'm still admiring them instead!